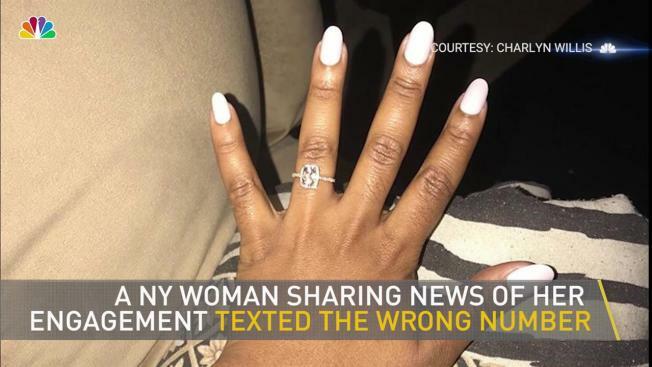 A Bronx woman intending to share news of her engagement with a friend texted the wrong number, reaching a celebrity who ended up becoming a very special part of her announcement. Charlyn Willis had texted a smiling selfie featuring her new ring to a number she thought belonged to her friend. Turns out the number belonged to Sarah Michelle Gellar. Gellar took to Instagram to broadcast the stranger's happy news to her 1.7 million Instagram followers: "This is Charlyn Willis... She got engaged today and texted her sister but by accident she got me... CONGRATS!!!!" Willis recorded the story and posted it to her Facebook, writing: "I guess the best way to announce your engagement is to have a celebrity do it for you. THANKS Sarah Michelle Gellar... AND YES, I SAID YES TO DEE!!!!" Gellar even chimed in on the Facebook thread, saying, "Here to help!!!!" Willis replied, "You really have no idea how amazing you are for this!" Willis tells News 4 she'd been trying to get in touch with her best friend from childhood -- a girl with whom she used to be so close they called each other sisters, and with whom she only recently reconnected on her last trip back to New York. "She was a kindred spirit, and I wanted to text her the news," Willis said. "I sent the selfie and said, 'I'm getting married' with a bunch of ridiculous emojis." Willis got a text message back from a woman named Jenna, who turned out to be Gellar's assistant. "Jenna said, 'Hey, just tell me who you are so I can forward this message to Sarah,'" Willis said. "I said, 'I don't know who Sarah is, but I apologize for the inconvenience! Have a nice holiday!'" Jenna responded, "This is so funny. I'm going to tell her your message anyway!" And that's when Gellar posted the photo to Instagram, helping the sweet little announcement go viral. "I was just fangirling," said Willis, who has been an avid follower of Gellar since the actress' "Buffy the Vampire Slayer" days, and can vividly recall when Gellar and Prinze got married. "As far back as I can remember, she's been a staple in my childhood life." "I'm not a teenybopper -- I don't cry and squeal and get stupid, but I've been losing my mind," Willis laughed. Willis lived in the Bronx all her life until moving to Savannah two years ago "for love." And it looks like it's all worked out.